One orchard mason bee can do the work of 100 honeybees. Mason bees don’t mess about brewing honey. They efficiently visit around 1,800 flowers a day, with a pollination rate of 99%. Honey producing bees visit roughly 700 flowers a day and pollinate approximately 5% of them. Mason bees are most active in early spring, in time to pollinate the early spring flowers on fruit trees and berry shrubs. 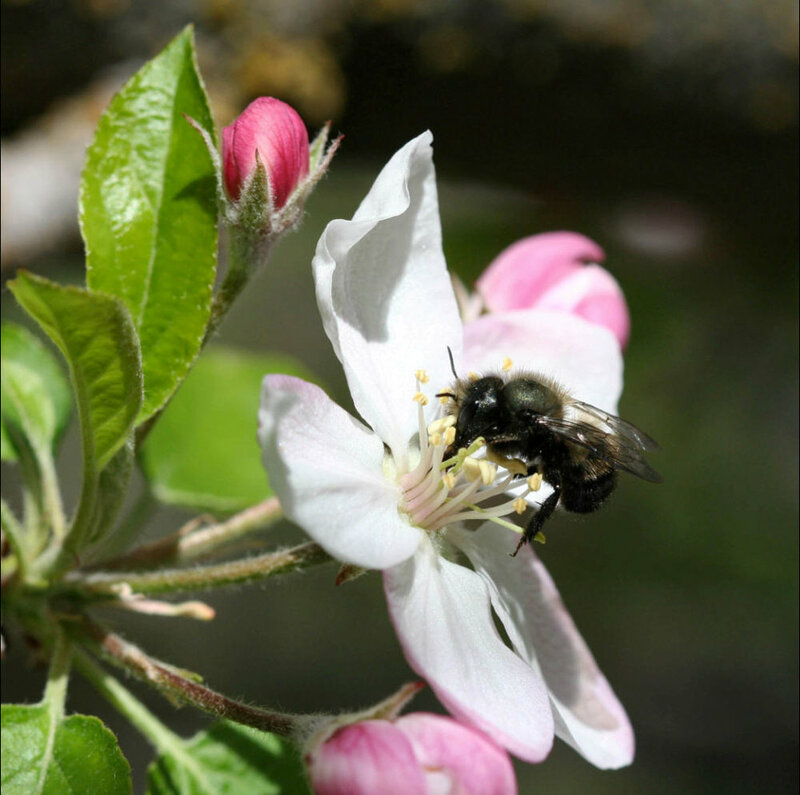 Most other pollinators are not active until the warmer summer months when the fruit tree blossoms have faded. Want a better cherry crop? Host some gentle mason bees. A “starting pack” of mason bee cocoons (six male, four female) can grow their population easily from ten to eighty in one lifetime (365 days). While mason bees can live in close quarters with others, they are solitary bees and do not form hives. This means they also do not develop protective, aggressive behaviors, like stinging. The males have no stingers and the females rarely sting. The few who have experienced the sting compare it to a mosquito bite. It does not cause anaphylactic shock. Pollinators are in plight. When you start hosting orchard mason bees, the efforts you make to increase their success will also benefit native and migratory bees, birds, butterflies, and other pollinating companions in need of food, shelter, and protection from pesticides. These “others” are a critical source of healthy balance in your yard-scape ecosystem. Reduce (or eliminate) your use of pesticides, fungicides, herbicides, and harsh household and automotive chemical cleaning agents in your yard. Add native plants to whatever space you have. You don’t need to replace everything by any means- a little goes a long way. Native plants = native pollinators. Alpine Strawberry (Fragaria vesca). These plants have lovely foliage, grow well in partial sun, and taste delicious. Choose plants for your space using the concept of “continuous bloom”. This doesn’t mean one plant that blooms year round. This is a series of plants that work in your conditions to bloom at different times, providing pollen and nectar year round for the native and nomadic pollinators. Allow a bit of clean water and wild space in your garden. Keep the grass longer in a small area, allow a few weeds to hang on, scatter some branches or twigs in, and even provide a bit of bare soil space. A varied environment provides great shelter, sustenance and building materials for pollinators. Mason bees do not live in a hive. They build mud caves of sorts in small holes. They spend most of their lifespan in these mud rooms and emerge from their cocoons as fully mature bees. The male adult lifespan is about two weeks, while the females live six weeks after emerging from their cocoons. After they mate with the males, they begin to build mud chambers for their eggs, filling them with pollen and nectar to sustain the egg through its larval and pupating stages. If all goes well, they should have a full lifespan of 365 days. But their chambers can be invaded by pests like mites or parasitic wasps. You can keep your bee colony healthy by using nesting materials that are easy to open and easy to clean, like wood trays or replaceable cardboard tubes. Ok. Here is the down and dirty how-to by month. Please find more resources to help you get started at the end of this post. Gather materials. If you buy cocoons now, keep them somewhere cool so they do no emerge before you are ready to place your bees outside. Assess your space to find the best location for your nesting box. Ideally, it will receive a few hours of morning sun with protection from afternoon rays. It should be off the ground, best with an overhang to shield it from the elements. The overhang can be from the eave of a building or a 2-3 inch lip on your box itself.The box should not be free to swing in the wind. Placing it at eye level is a great way to spy on the gentle bees without straining your back. Check the weather and the flowers. Mason bees emerge from their cocoons when daytime temperatures are in the mid-fifties. This usually occurs when the dreaded dandelions start blooming, or when cherry trees are barely starting to open. If it’s warm enough, it's time to put your cocoons outside. Mount your nesting box. Fill it with clean dry nesting tubes or trays. If you are in your second year, you will need double, or even triple a number of nesting boxes and tubes to keep up with your growing population. Dig a hole close to the nesting box as a source of damp clayey mud. One good, steep shovelful will do (steep is important, the bees want to harvest mud from vertical walls). If your soil is very sandy, buy some clay to add. The mason bee jaws are too small to carry mud particles larger than clay. Provide a birdbath or other source of clean water near the nesting box. If your cocoons are in a cardboard box, open one flap and tape the box to your bee house. If you have loose cocoons, place them in a tinted container (clear makes them cook...) with a pencil sized hole in it for the bees to fly through when they emerge. A prescription bottle with a hole drilled in the lid is quite adequate. Or a piece of PVC pipe with a cap and a hole. Place this container right next to the bee house. You may release your bees in stages to space out pollination. However, this is best done once your colony numbers have grown to twenty or more. Release 1/3 of your cocoons each week for three weeks. Make sure there are a few of the larger cocoons in each batch. Those are the females. The males will emerge first, forage for food, and then await the ladies. The females usually come out of their chambers 1-3 days after the males, mate, find food, and then seek out their future nesting sites. Once they find a proper hole, they will start building mud chambers, filling with pollen, and laying eggs immediately. Bees should be very active at this time, enjoy them! They wake each morning when the sun warms them up. You can watch them bumble around the entrance to their home before they fly off to do their tasks. The females will be back and forth to the nesting box, bringing mud to build the chambers, and pollen to store up for the egg she will lay in each tube. Each female lays around 20-30 eggs, six per tube. Each egg gets its own mud chamber. Once a tube is full, she will move on to a new nesting hole. Check your mud regularly. Do not let it dry out. The females are very particular about their mud. If you keep the base of the hole wet, the moisture will rise up the sides of the hole, giving her a nice range of mud consistency to harvest from. At this point, the females finish all nesting activities and the nesting tubes will benefit from added safekeeping. You can move the entire bee nesting box to a garage, basement, or potting shed. This protects the cocoons from hungry summer pests, like birds and mice who eat the cocoons, or wasps and other parasites that invade the nesting chambers and lay their own young inside. It also keeps the late-summer heat off. Enjoy your bumper crops of fruit and vegetables. At this stage in their life cycle, mason bees can be harvested from their nesting tubes. As you open your tubes or trays, check for orange masses of mites, holes in the side of the tubes, or other signs of trouble. If things look good, move the cocoons into a mesh bag, and keep in a cool basement or garage. Cocoons can be kept in a refrigerator, but steps should be taken to ensure they have a source of humidity. Check your cocoons. If you have a surplus, consider sharing them with family, friends, neighbors, or local schools and community centers. At our store, we sell mason bee cocoons, nesting houses, nesting tubes, nesting trays, bee-keeping literature, and even powdered clay if you need to supplement sandy soils. We source our bees (and clay) from Crown Bees. We also sell plants to keep all your pollinators happy! A special thank you to Crown Bees for answering many questions for this blog. Crown Bees is a leader in the mason bee community. They have a wealth of bee nesting materials, and a phenomenal outreach and education program. Their website also has how-to videos. Yes, they have great bird info and resources. But they also sell mason bees and houses, and their website gives clear tips and procedures. Griffin, Brian L. The Orchard Mason Bee: The Life History, Biology, Propagation, and Use of a North American Native Bee. Knox Cellars Publishing Company, 1999. Hunter, Dave and Jill Lightner. Mason Bee Revolution: How the Hardest Working Bee Can Save the World One Backyard at a Time. Skipstone, 2016. Dogterom, Margriet. Pollination with Mason Bees: A Gardener’s Guide to Managing Mason Bees for Fruit Production. Beediverse Publishing, 2002. Bosch, Jordi and William P. Kemp. How To Manage the Blue Orchard Bee: as an Orchard Pollinator. Sustainable Agricultural Network Handbook Series.